1) This paper has been prepared and presented at the FIG Congress 2010 in Sydney, Australia, 11-16 April 2010. This paper provides a good introduction for those who are thinking about the question whether to invest in laser scanning. Handouts of this presentation as a .pdf file. Terrestrial Laser Scanning is quite legitimately starting to take a larger stake in the domain of mainstream land surveying. This technological advancement is similar in significance for the industry to what RTK GPS was doing a decade or so ago, and it seems only logical that over the next decade 3D scanning technology will evolve into a mainstream tool in the arsenal of most land surveying organizations. This paper overviews some typical projects where Terrestrial Laser Scanning is changing peoples perceptions of the complexity, accuracy and efficiency in which spatial data can be captured by the modern surveyor. The examples are presented in easily digestible overview format, including the benefits and limitations encountered. Towards the latter half of the 1990’s I was embarking on the early stages of my professional surveying career. At that stage real time kinematic GPS was starting to emerge as the latest and greatest in the world of conventional surveying, following on from the success of post-processed GPS which had revolutionized certain measurement applications, but had failed to capture the imagination of many in mainstream topographical surveying. Within that field surveyors have traditionally been cautious when it comes to adopting new technologies; after all in many cases the tried and tested methods covered their requirements for long periods of time. The end result was that using traditional tried and tested techniques were often the fall back position. However over the last decade the above factors have slowly been mitigated, to a point where RTK GPS (or its modern derivatives such as Network GNSS) have become commonplace, if not indispensible in our industry. When I first saw laser scanning in action a couple of years ago, I saw many parallels to what I had witnessed in the 1990’s with GPS. Laser scanning was not in its infancy, it had been carving out a niche in certain spatial applications for well over a decade. However it was, in my opinion, on the verge of breaking out as a serious contender in the field of mainstream surveying. The familiar obstacles, as listed above as items 1 to 5, lay in its way. It seemed only logical to me that the next 5 years would see similar infiltration to a point where scanning will become a mainstream tool in the land surveying industry. This paper examines some recent examples to illustrate where the technology is currently being put to good use within the surveying discipline of Aurecon in Australasia. In large open areas which require efficiency of data collection at a level of accuracy not obtainable by LiDAR (or a scale where the cost of LiDAR can not be justified), TLS is a very viable option, and have the added bonus of being able to produce some nice looking outputs to go along with the standard deliverables such as contour models and volume calculations. Overview of the 3D model of the Earthworks site. 7ha earthworks site, Tauriko Industrial Estate Stage 2, Tauranga, New Zealand. Creation of digital terrain model to calculate volume of earth excavated since beginning of current earthworks season (surface comparison). RTK GPS, typically 3 days surveying by 1 surveyor, with the ground model generalized by major changes of grade and sampled spot heights. Potential health and safety hazards include the surveyor walking around live excavation areas and having to walk close to the top of steep embankments to capture the change of grade string. 3D visualization was used to bring the site to life on the computer screen for the project managers. Scanning would have been more difficult in marginal weather. 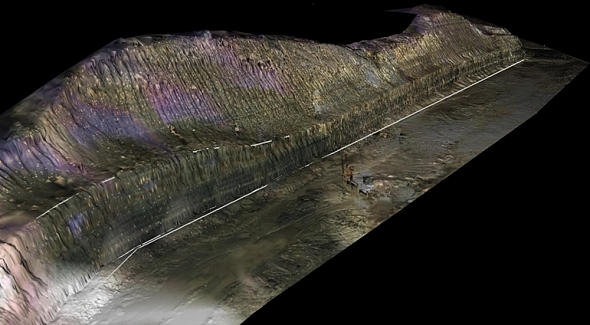 500m of highwall (in 2 locations) as part of a topographical survey of the subject site. Supply of detailed ground information for site prior to the commencement of excavation for the coal seam drilling. Scanning from 5 locations on the embankment, merged into 1 digital terrain model decimated to an average of 1 point per 0.5m, then exported to be processed in 12D along with the topographical detail captured on the rest of the site. Total time on site was less than 1 day, including site induction requirements. 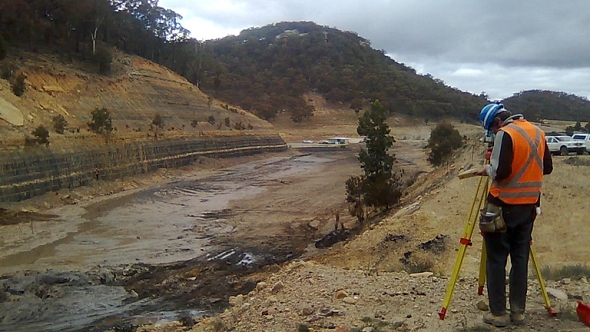 In the preliminary survey of the site, reflectorless total station measurements were taken at various locations along the high wall to model the general slope. For safety reasons, no personnel were allowed on or above the highwall without specialist equipment and training, along with a task specific safety plan. Some areas were heavily eroded with deep ruts (which would typically be ignored by a surveyor) so the decimated ground model was quite spiky in some areas on the bank, however decimation had to be applied to ensure the ground model file was not too large to be handled by other software. Through the recent economic downturn it has been general infrastructure work that has kept many firms in business as governments sought to buy their way out of recession through investment in various projects. 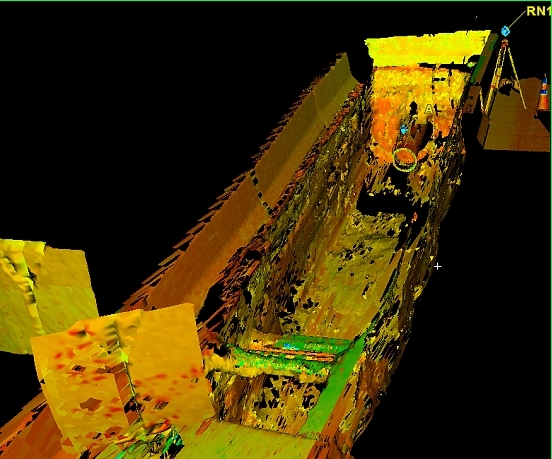 As firms look for a competitive edge, the use of laser scanning can provide not just a point of difference but a smarter more innovative way of approaching many of the spatial requirements of these projects. Over the course of 2008 Aurecon (formerly Connell Wagner) was commissioned to work on the Johnsonville Rail Upgrade project to develop a new highly optimised track alignment through seven horseshoe shaped, brick lined, tunnels which were more than 100 years old. Each tunnel was between 100-200m long. The goal was to enable significantly larger passenger trains to pass through with a minimum amount of modification work to the tunnels. 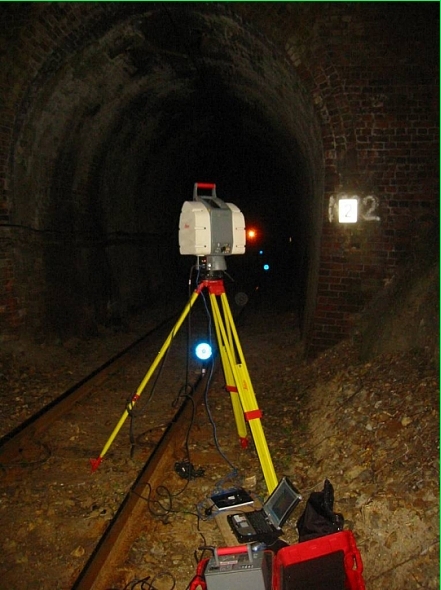 The spatial modelling approach developed by Aurecon utilised laser scanning technology to build 3D models of the tunnels to the requisite accuracy to be utilised in the rail alignment redesign and clearance modelling. The scanner was used to ”Traverse” through each tunnel with a setup just outside each portal, and an average of one setup per 60-100m inside the tunnel (depending on curvature). All scanning was conducted at night during a 5 hour line shut down period at an average of between 1 and 2 tunnels per night. 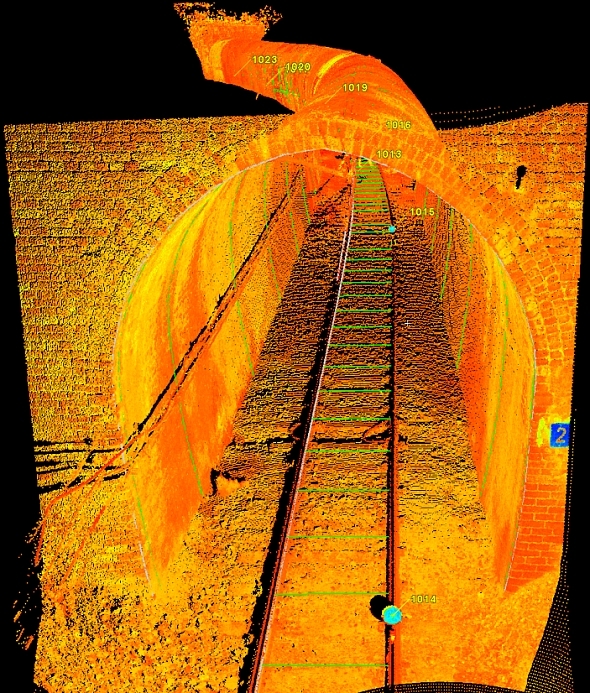 Resulting point cloud models were reduced to cross sections at between 1 and 4 m intervals (depending on curvature) including inside running edge of rails, overhead wire position, and minimum clearance to tunnel wall. Prior to laser scanning I would have carried out a job like this by traversing through the tunnel and capturing cross sectional shapes using reflectorless total station (probably using someone with a laser pointer to scribe out each section on the wall so that you could see where you were pointing), or alternatively that person holding a prism on the wall at each measurement location (and thus requiring the overhead wire to be turned off). This is a very slow method if considering the level of detail required on this project, and does not guarantee that you are always capturing the wall at the point of minimum clearance. No downside about working at night in poor lighting conditions. Processing time was quite labour intensive to extract clearance sectioning in the required format because scan software provided no functionality in this regard. Modification of prefabricated polyethylene pipe which did not fit the bend it was designed for. The open excavation of the pipe bend location was in the middle of a major urban arterial road in the city. However the prefabricated pipe did not fit the excavated curve and therefore the spatial location and the direction of the pipes ends at the extremities of the excavation were required, in addition to the shape of the prefabricated pipe lying nearby the site. Once this information was captured an iterative approach with the contractor was undertaken to derive the preferred modifications to the existing pipe using the resources they had on site, achieving a shape that could be coupled to the existing pipes, and could be installed clear of the existing utility services in the trench. 2 Scanner setups were used to capture the trench details (1 on the floor of the trench, and 1 just above one end), and 2 scanner setups were used to capture the shape of the prefabricated pipe. All the pipework on site modelled as spatial elements within Cyclone software was then imported into AutoCAD for spatial manipulation and drawing outputs for the contractor. A double prism pole would be used to capture the spatial location of the existing pipework within the confines of the trench, as well as the prefabricated pipe shape, however the risk of any proposed modification still resulting in a misfit, or clash with any other elements in the trench meant that the laser scanning could be easily justified in this case. Bulky equipment (including cables, laptop and battery) to move in and out of trench. Meshed view of one end of the excavation trench. 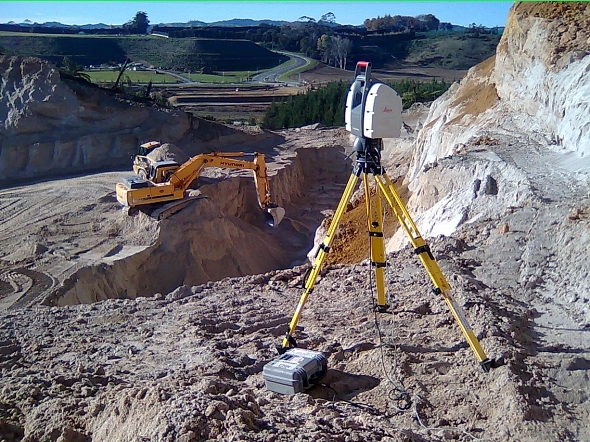 This has traditionally been the field where laser scanning has developed over the past 10 years, as surveyors and engineers are often called on to provide spatial measurements in complex environments. Where as conventionally one might provide distinct measurements at various locations (maybe cross referenced against photographs), laser scanning can be a viable option where more complete information is required, or limitations exist regarding the ability to make direct measurements. Modelling of the High Pressure, Low Pressure, Cold Reheat, and Hot Reheat pipework between the steam generators and the turbines. Measure the deformation of main steam pipework between shutdown (cold) and running (hot) conditions to cross check against expected movements, as well as provide as-built drawings of the pipework dimensions. 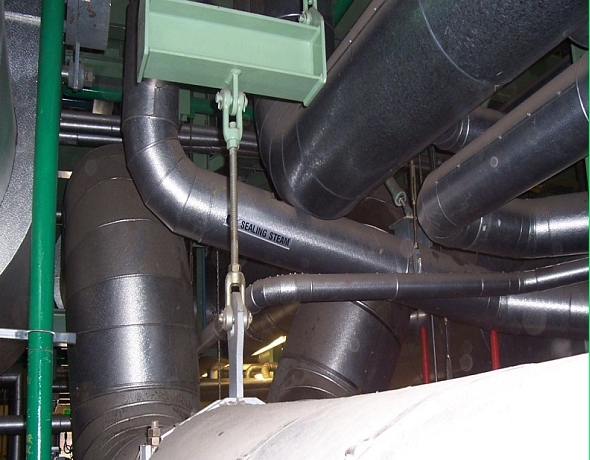 Typical view of the complexity of pipework around which the 4 main pipes weave. 32 to 36 scanner setups over 3 days were used during each of the two surveys to capture enough data on the four pipes, including their accurate locations at each of the support points. Pipe movements were up to 200mm between hot and cold positions. Adhesive scan targets were installed on walls and beams to provide control between the 2 scans, and residuals on these marks were typically less than 5mm between the two surveys. Pipe positions were compared at each of the support points to derive DX, DY & DZ values between the two surveys, to an estimated accuracy of +/- 5mm (1 s.d.). Movements have traditionally been measured by the installation of fixed targets (often painted on the pipes) to measure the movement at distinct locations. Some support points allow direct measurement at that location (e.g. a sliding plate joint, or a spring loaded lower support). The lack of as-built drawings for even modern plant is testament to the fact that creation of these drawings is not a straight forward surveying task in most cases and drawings are often left incomplete. Many setups required to capture full 3D information in areas often obstructed by plant or scaffold (in the case of the cold survey conducted during the shut down period when many other people were working on site). If only distinct locations are chosen to measure they are often chosen in locations which are easiest to see. Processing time is required to clean up scan data, model pipework, and measure deformations from the scan model. 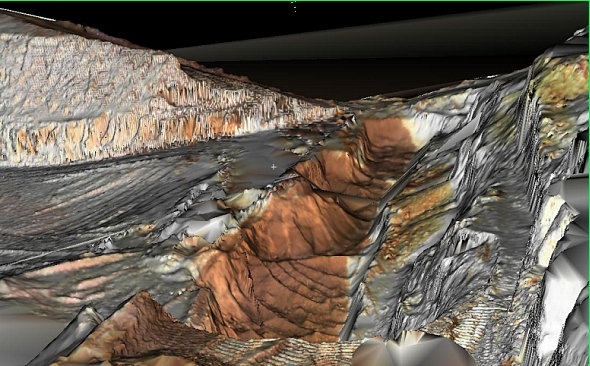 Highlighted in this paper are just a few examples of how Terrestrial Laser Scanning solutions have been applied on projects where up until very recently traditional surveying methods would have been the norm. As more people are made aware of the benefits that laser scanning bring, then their expectations from their spatial data suppliers will rise accordingly. Concurrent with this change in attitude will be ongoing further refinement of technology (both hardware and software). The end result will be that laser scanning technology, like real time GPS did before it, will inevitably become commonplace within the realm of mainstream land surveying. All content within this paper have come from the personal experience of the author. Special thanks to Geoff Munns of Aurecon’s Auckland office for peer review of this paper. Mike Pinkerton (BSurv – Otago University; MNZIS) is a Senior Surveyor based in Aurecon's Tauranga office and has over 13 years professional experience within the surveying discipline. He has extensive experience in the application of GPS and Laser Scanning in surveying as well as working on large scale engineering and topographical surveys in Australasia, Southeast and Central Asia, UK, the Middle East and North Africa. In his current role within the Survey discipline of Aurecon he provides specialized input, support, and management for project work across the Asia Pacific Region within Aurecon’s different market groups: Community Infrastructure, Transport, Buildings, Water, Energy, Mining and Industrial.